More than 100 design houses, including Alexander McQueen, Christian Louboutin, and Oscar de la Renta, have created items for an exclusive collection celebrating Bergdorf Goodman's 111th anniversary this fall. 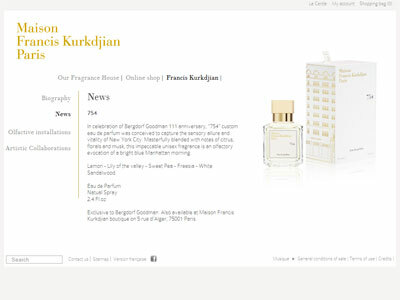 Master perfumer Francis Kurkdjian's contribution is a beguiling new custom fragrance, 754 (named after the store's Fifth Avenue address). The fragrant floral and citrus notes evoke a perfectly crisp fall morning in Manhattan.